It’s January. Wouldn’t you like to be a little bit happier this year? How about a lot happier? Would it surprise you to know that a reasonably certain path to happiness is a straight line out the door of a flying plane? Come to find out: It is. By and large, skydivers are some of the happiest people in the world. This fact will be self-evident the very first time you walk onto a dropzone campus and are greeted by a lot of grinning faces. You’ll know from that first moment, you’ll definitely want some of that glow. Here’s how you too can get it! Experience the happiness of a successful skydiving jump! Science has spoken: There’s no surer route to unhappiness than stagnancy. For whatever evolutionary reason, nature hardwired humans to always look towards the next tough challenge to tackle, and getting what you want only makes you feel good until you’re squaring up the next level. That’s why you start showing up late to your dream job a few months after the nameplate is on your office door; why that championship trophy is only fun to look at for a few months; why even the hottest celebrity couples all seem to end up cheating on each other. The trick is to finding a healthy expression for the kind of personal challenge that intelligently pushes limits. 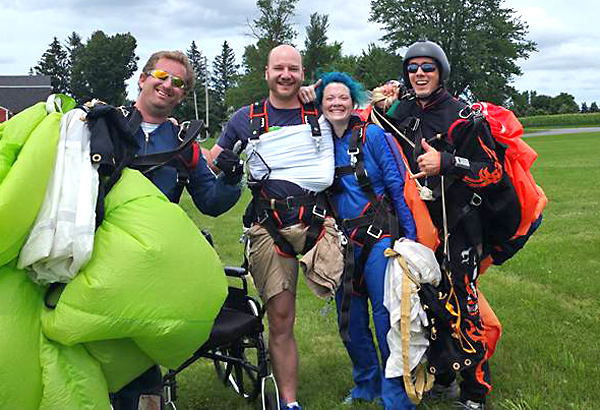 That kind of challenge can revolutionize every life it touches – and skydiving is just the ticket. Skydiving is hyper-precise and high-octane and super-intense. It requires its participants to work just a little bit harder on every job. It’s a tough undertaking… but it’s incredibly fun. And just the golden ticket into the club of the happiest people in the world. Skydiving gives a flat-feeling life shape and dimension and direction. Whether we’re training for a world meet, preparing our skills to team up with loads of other talented athletes for a huge world record or packing our bags for travel to a skydiving boogie with hundreds of our friends, skydiving never fails to bring pizzazz to our calendars. This is even true when we’re just sitting at work on a Wednesday, feening for a Friday sunset jump. Having a constant source of twitterpated anticipation changes everything, and skydiving is a fountain thereof. Are those some of the happiest faces, or what? That might sound like a brag, but it’s very much the truth. The worldwide community of skydivers represents every imaginable facet of humankind in a single inclusive, dedicated, passionate, affectionate and just-plain-rad amalgam. So come on – why not become one of the happiest people in the world? Forget your troubles, chase your cares away and come on, get happy! 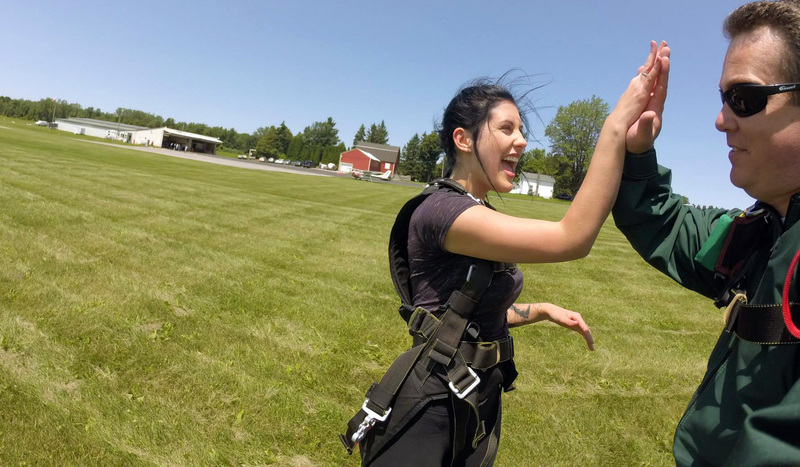 We heartily invite you to head out to meet us at WNY (“Why Not You?”) Skydiving and tackle your solo skydiving certification. We’re looking forward to welcoming you into our “skyfamily”!